This article is about the recruitable character. 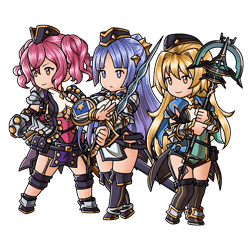 For the summon stone, see Levin Sisters (Summon). [Reliable Sisters]This title is an unofficial, amateur translation. 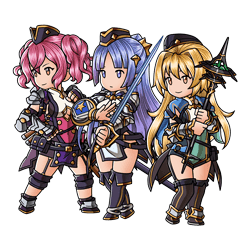 Strengthened by their sisterly bonds, these three valiant Sky Knights are steadfast in their duty to protect the Kingdom of Levin. With their intimate knowledge of each other's strengths and weaknesses, their teamwork can overcome any crisis. Lightning Strikes Thrice Massive Light damage to a foe. 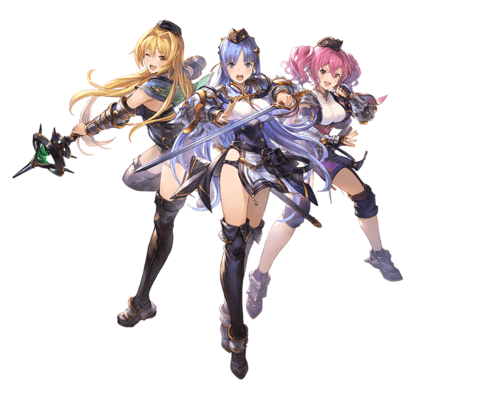 Aqua Blade Linked Skill:Certain characters have skills where the cooldown is linked with that of the character's other skills. When such a skill is cast, all other skills linked to it will share the same cooldown. As a result, only one linked skill can be cast during the same turn. ⇧ Lvl 55This skill is enhanced at level 55. 500% Light damage to all foes (Damage cap: ~590,000). 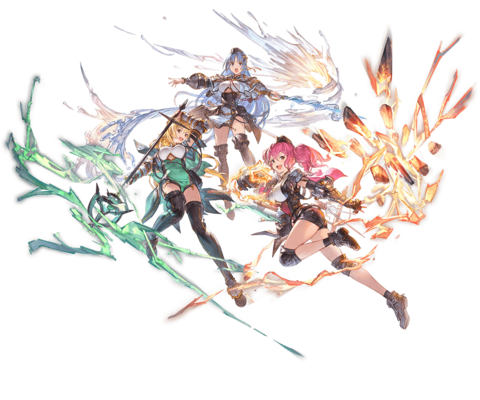 Brave Combat Linked Skill:Certain characters have skills where the cooldown is linked with that of the character's other skills. When such a skill is cast, all other skills linked to it will share the same cooldown. As a result, only one linked skill can be cast during the same turn. ⇧ Lvl 75This skill is enhanced at level 75. 2-hit Light damage to a foe. Healing Evolution Linked Skill:Certain characters have skills where the cooldown is linked with that of the character's other skills. When such a skill is cast, all other skills linked to it will share the same cooldown. As a result, only one linked skill can be cast during the same turn. Restore 20% of all allies' HP (Healing cap: 1500) and remove 1 debuff. Reduce all allies' Dark damage taken by 10%. Guaranteed double attacks. 15% Bonus Light DMG effect upon triple attack. Local status effect has a 40% chance to last 1 turn and 60% chance to last 2 turns. This page was last modified on 30 March 2019, at 22:58.